Zimmermann, Watteau (1912), no. 57. Dacier, Vuaflart, and Hérold, Jean de Jullienne et les graveurs (1921-29), cat. 97. 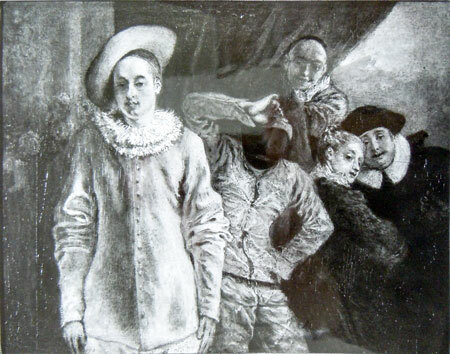 Réau, “Watteau” (1928), under cat. 60. Adhémar, Watteau (1950), cat. 163. Brookner, “French Pictures at Waddesdon” (1959), 273. Levey, “French and Italian Pictures” (1959), 57. Waterhouse, Waddesdon Manor (1967), under cat. 135. Macchia and Montagni, Watteau (1968), cat 155. Ferré, Watteau (1972), under cat. B73. Plock, “Pierrot, Harlequin and Scapin” (2011). 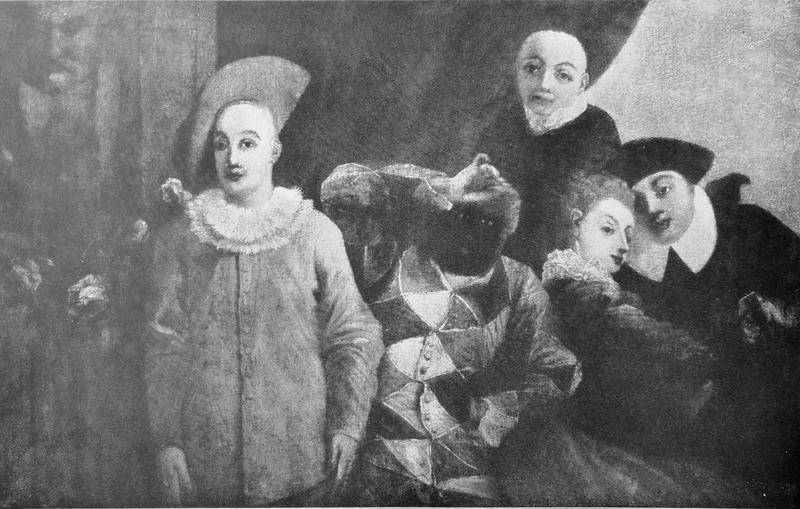 In the past some Watteau scholars—especially Zimmerman, Dacier, Vuaflart, and Hérold, and Adhémar—believed in the priority of the Althorp versions of Arlequin, Pierrot et Scapin and Pour nous prouver que cette belle. In accepting the Althorp versions, Dacier, Vuaflart, and Hérold were apparently unaware of the Waddesdon Manor picture and, as well, the pendant in the Wallace Collection. Zimmerman accepted the Althorp Arlequin, Pierrot et Scapin as the original but, curiously, rejected its pendant at Althorp, preferring instead the version in the Wallace Collection. 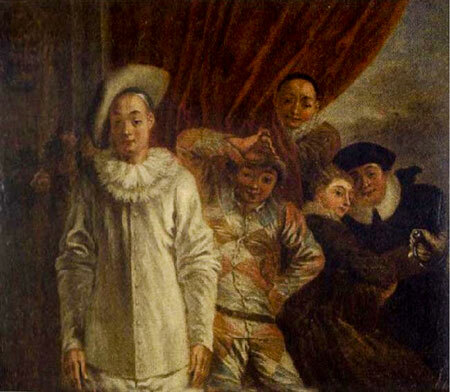 Adhémar, although aware of the Arlequin, Pierrot et Scapin with the Frankfurt Rothschilds but only through Réau’s account, accepted the authenticity of the Althorp version but not its pendant there. However, the authorship of the Althorp pendants, together ever since their creation, cannot be divided. 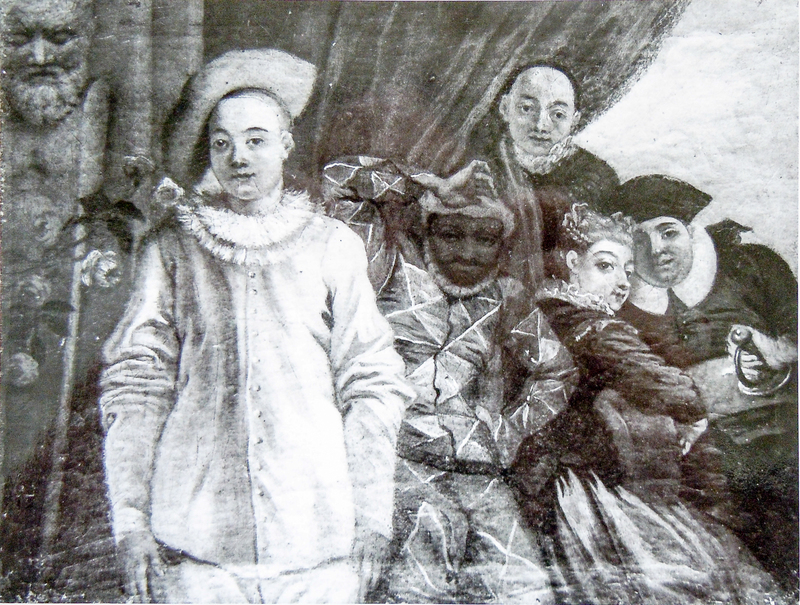 The physical evidence of the Waddesdon version of Arlequin, Pierrot et Scapin demonstrates that it is Watteau’s autograph work and all this early disarray, much of it caused by the lack of communication across the Channel, can now be passed over. The provenance of the Althorp paintings has been confused with that of the primary works at Waddesdon Manor and the Wallace Collection. The whereabouts of the Althorp paintings in the eighteenth century are unknown. They are not recorded in the Althorp inventories of 1742 and 1750, but they must have arrived at Althorp in the second half of the eighteenth century since they were listed in situ in the 1802 inventory and have remained there ever since. Thus, any attempt, such as the one by Dacier, Vuaflart, and Hérold, to associate them with paintings sold in the nineteenth century must be rejected outrightly. Moulins, Musée Anne de Beaujeu, inv. MI 1420. Paris, collection of Dr. Louis La Caze (1798-1869; physician); donated to the Musée du Louvre; transferred by the museum in 1872 to its depot in Moulins. Paris, Musée de la monnaie, Pélerinage (1977), cat. 178 (as by the École française du XVIIIe siècle, Arlequin, Pierrot et Scapin, lent by the Musée des beaux-arts, Moulins). Adhémar, Watteau (1950), under cat. 163. Macchia and Montagni, L’opera completa di Watteau (1968), under cat. 155. Faroult and Eloy, La Collection La Caze (2007), 277. Catalogue interministériel des Dépôts d'Oeuvres d'Art de l'Etat (2013). When the celebrated collector Dr. La Caze owned this painting he apparently thought it was by Watteau himself. It was with this understanding that it was bequeathed to the Louvre along with La Caze’s many other masterpieces. After it was realized that the picture was only a copy, it was transferred to the Moulins museum in 1872. Since the mid-twentieth century when Watteau scholars became aware of this picture, they concured. Jean Lévy, former curator at the Louvre, is alone in having defended the priority of the Moulins painting (letter of January 13, 1959, in the Waddesdon Manor achives). 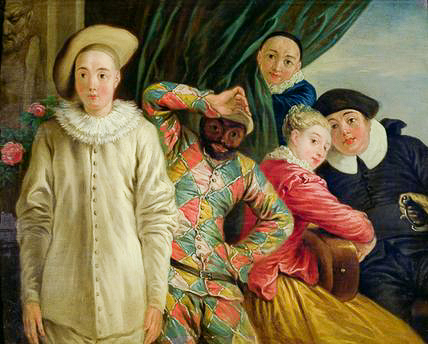 In Watteau’s version Harlequin wears the traditional dark-colored mask. The copyist responsible for this version painted an unmasked Harlequin, and his face reveals the unskilled nature of the copyist. Braun, Catalogue général (1887), 160, no. 704. 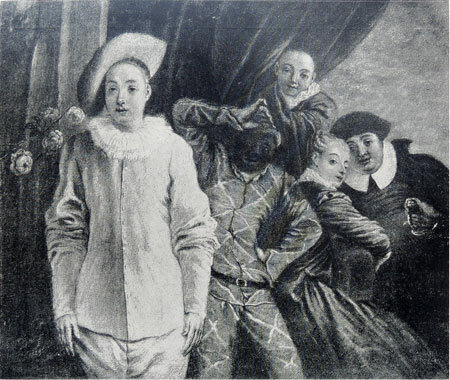 Zimmerman, Watteau (1912), no. 139. Dacier, Vuaflart, and Hérold, Jean de Jullienne et les graveurs (1921-29), under cat. 97. Macchia and Montagni, Watteau (1968), under cat. 155. This copy is distinctively wide in relation to its height. It was photographed by Braun prior to 1887 and although Zimmerman published the image in 1912 as being in the Opigez collection, it is not certain that it was still there. No twentieth-century scholars seem to have seen the painting firsthand. Paris, collection of M. de Wailly; his posthumous sale, Paris, Hôtel des ventes, February 17-18, 1853, lot 8: “Watteau (Composition gravée de). Colombine, Pierrot et Arlequin. Scène du théàtre Italien.” Sold for 51 francs. This version may well be one that has come down to us, such as the one that La Caze could have bought in the 1850s or ‘60s, or the one that Opigez owned by at least the 1880s. But, lacking a more specific description of de Wailly’s picture, it is not possible to procede any further. Paris, Musée de la monnaie, Pélerinage (1977), cat. 179 (as by the École française du XVIIIe siècle, Arlequin, Pierrot et Scapin, lent from a private collection). While conforming to Watteau’s model in most respects, the copyist altered the herm at the left. More importantly, he changed Watteau’s color scheme—giving the woman a bright costume of red and yellow, Harlequin a much more intensely colored scheme of diamonds, and the curtain is green rather than the customary red. All this suggests that he worked from Surugue’s engraving rather than from Watteau’s painting. Gray, Collection Edmond Pigalle (1844-1921); donated to the Musée Baron Martin in 1921. Mirimonde, Catalogue du Musée Baron Martin (1959), cat. 429. Mirimonde and Davoine, Musée du Baron-Martin, Gray (1993), cat. 750. In cataloguing this work in 1959, Mirimonde ascribed it to an imitator of Watteau working no earlier than the second half of the eighteenth century. But then he muddied the waters by questioning whether the composition engraved by Surugue was actually by Watteau. Instead, Mirimonde proposed that it was a pastiche after figures taken from diverse Watteau paintings and then perhaps brought together and painted by Philippe Mercier. This is a complicated and unnecessary hypothesis that has no basis in actuality. In the museum's 1933 catalogue, the picture was dated to the nineteenth century. The doubt as to Watteau’s authorship of the original composition was reiterated. Modern Watteau scholars have apparently remained unaware of the picture in Gray. City unknown, collection of a M. de Lattre. 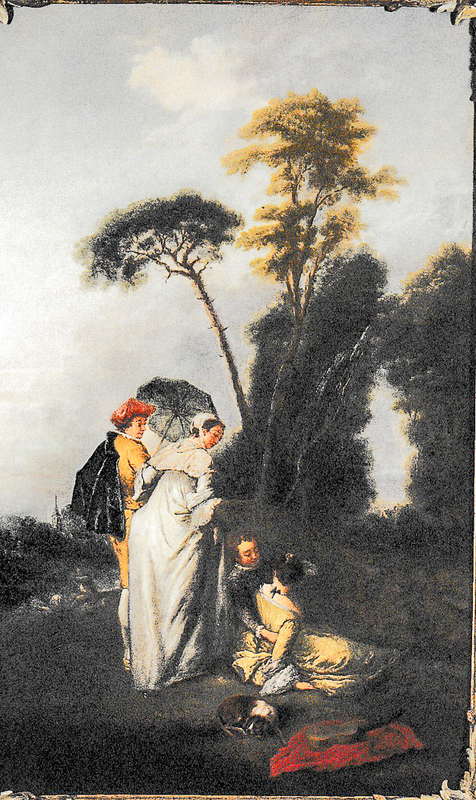 Sale, London, February 25, 1897, lot 47: “Watteau . . . A group of five masquerade figures.” It was described as having previously been in the collection of a M de Lattre, and it was noted that it had been engraved. Dacier, Vuaflart, and Hérold, Jean de Jullienne et les graveurs (1921-29), under. cat. 97. Except for Dacier, Vuaflart, and Hérold’s citation of this painting in an 1897 sale, it has not been possible to trace this picture further. No London sales for this date have been found and it has not been possible to identify M. de Lattre, the previous owner.